There are four generally recognized forms of poliomyelitis. The Asymptomatic Carrier, the Abortive, the Non-Paralytic, and the Paralytic. The first two have no known lasting effects and will not be dealt with in this reference. The non-paralytic form of poliomyelitis is usually indicated by nausea, headache, sore throat, back and neck stiffness and pain. In addition, there are changes in reflexes and an elevated spinal fluid cell count. It is estimated that 65 percent of recognizable cases during the polio epidemics were non-paralytic. It is possible that there may be some unrecognized muscle involvement. Paralytic poliomyelitis shows the same symptoms as the non-paralytic plus weakness in one or more muscle groups. It is commonly classified in the following manner: SPINAL: This type is most frequent and is associated with involvement of the trunk or extremities; more often the lower extremities. Weakness does not fit any pattern. BULBAR: Symptoms can include difficulty in swallowing, loss of voice quality, and sometimes tongue and facial paralysis. BULBOSPINAL: This type of involvement is usually severe and is associated with respiratory impairment. Ten to twenty-five percent of the paralytic cases seen during the polio epidemics were of the bulbar or bulbospinal type. The polio virus affects the body by attacking the central nervous system; specifically the anterior horn cells. These motor neurons are located in the front part of the spinal cord and are essential for any muscle activity. The simplified diagram to the left shows a cross section of the spinal cord. 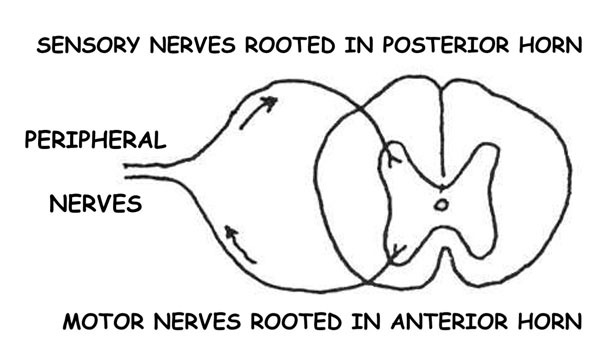 The motor neurons rooted in the anterior horn travel outward through the peripheral nerves to innervate muscle fibers. Depending on the location of the muscles they supply, these motor neurons can be a few inches or several feet long. Sensory nerves travel from their specialized receptors to the spinal cord and enter the posterior horn. Sensory nerves are not directly affected by the polio virus. Many individuals lost considerable function during the acute stage of polio but regained a large part of that function. It appears, however, that a percentage of these individuals are experiencing renewed weakness, sometimes accompanied by fatigue or pain. Definitive studies are incomplete, but the best medical evidence at this time would indicate that a combination of factors associated with overuse is responsible. If we take a closer look at the recovery process we can see why this is so. The polio virus attacks randomly. Sometimes motor neuron damage is not severe and the cells can recover much of their function. Other neurons may sustain more complete and irreversible damage. Even if this is the case, however, function can often be restored by “sprouting”. Motor neuron cells have the ability to send out new axons that can innervate neighboring muscle fibers whose own neurons have been destroyed. Motor neurons normally innervate between 200 and 500 individual muscle fibers. If a percentage of motor neurons are destroyed, and sprouting takes place, the remaining motor neurons may be innervating as much as four times the normal amount of muscle fiber. It is assumed that the additional load that this places on motor neuron metabolism will, over the years, cause a failure of impulse strength. This seems to begin about 20 to 30 years after polio onset, and is probably a contributing factor for the renewal of weakness. Another possible cause for this renewed weakness, especially in older individuals, is the normal loss of motor neurons. This is a natural part of aging. It is estimated that a person will begin to lose about one percent of their motor neurons per year after the age of 60. This is not very significant if an individual starts with 100% of their motor neurons, and all of these motor neurons are intact and undamaged. Unfortunately, this is not the case with many older polio survivors. Their supply was depleted by the polio virus, and this gradual loss will have a much greater impact. Some individuals may have gained a degree of recovery by building up the strength of their remaining musculature by exercise and intense use, similar to athletic training; a term called hypertrophy. These individuals, however, used this strength in their day-to-day activities and thus the muscles have been performing continually at a level that is no longer tolerated. In addition, many affected muscles that were believed to be “good” or “normal” with manual muscle testing, have been found to be less than this when electromyography (EMG) and other studies were done. In normal activities these muscles have also been working harder than was once believed. Muscle weakness due to polio is often asymmetrical. This can put added stress on the entire neuromusclular system, as well as adding strain to joints and supporting ligaments. The result may be an increase in arthritis-like pain. The question now arises, what can be done to alleviate this condition or prevent the further degradation of muscle strength? First, individuals should seek medical advice to rule out other possible causes for their symptoms. Just because a person has had polio does not make them immune from other physical ailments. Second, it is highly recommended that a complete physical evaluation be done. This should include an examination by specialists who are familiar with polio. You should ask for these test results in writing. Even if no immediate problem exists, this will provide a baseline for measuring your future status. Many individuals have asked about the role of exercise for those experiencing the late effects of polio. Unfortunately, the jury is still out on this question. There have been studies that indicate a ten percent increase in muscle strength following closely monitored exercise programs. If a person feels they may benefit from additional exercise then an aerobic type of exercise is probably best. A twenty minute program consisting of two to three minutes of activity followed by a minute of rest could be tried. If this makes you feel better continue but, if pain or fatigue results, reduce the exercise until you find a level that can be tolerated. Stopping completely may be best for some. A significant percentage of polio survivors get all the exercise they can tolerate in their activities of daily living. And, if it is true that overuse is a contributing cause of renewed muscle weakness then strenuous exercise regimens should be approached with caution. An orthopedic specialist may recommend braces, or other assistive devices, to help relieve the stress that is being placed upon weakened muscles and joints. In some cases this is sufficient to halt the progression of weakness. Selective surgery can sometimes redistribute the residual control so that strain is reduced. Using assistive devices (electric wheelchairs, scooters, etc.) is resisted by some individuals. They feel that they are “giving in” to their new symptoms. What they assume to be a burden can actually be very liberating. Using these aids will allow them to conserve their energy for those activities that they feel are most important. Because pulmonary function has such an important bearing on an individual's general health, this area deserves special emphasis. Standard tables for vital capacities list variables for age and height. These may not have much relevance for many of us. Actual volume, measured in liters or milliliters, is a better indicator of pulmonary status. This test, usually done with a spirometer, is simple and non-invasive. It is a good idea to have your vital capacity measured lying down as well as sitting. For anyone with a volume of less than two liters a follow up should be made at least yearly. Arterial blood gas measurements for CO2 may be warranted. Generally, CO2 levels between 35 and 45 are considered normal. The CO2 level in your blood can become elevated, gradually, without one being aware of the change. If the level becomes high enough, the blood's ability to carry oxygen will be impaired. This could result in headaches or interrupted sleep patterns and may be an indicator of respiratory insufficiency. Respiratory function can also be affected by scoliosis or a reduction in rib cage flexibility that often occurs as a person ages. The United States Department of Health estimates that there are over one million polio survivors in the United Sates. This would make polio the second largest cause of disability in the U.S. Only stroke survivors constitute a larger group. Although a significant percentage of these polio survivors are experiencing some late effects there is no reason to expect that all individuals will be affected. If you would like more information on this and related topics we recommend you read the various publications of the Post-Polio Health International (formerly Gazette International Networking Institute G.I.N.I.). Inquiries relating to these publications should be directed to Post-Polio Health International at 4207 Lindell Blvd., #110, St. Louis, MO 63108. Telephone (314) 534-0475 or Post-Polio.org. Hay cuatro formas generalmente reconocidas de poliomielitis. La del portador asintomático, el abortivo, el no-paralítico, y el paralítico. Los dos primeros no tienen ningún efecto duradero conocido y no nos ocuparemos de ellos en esta referencia. La forma no-paralítica de poliomielitis está indicada generalmente por náusea, dolor de cabeza, dolor de garganta, dolor de espalda y de cuello, y rigidez. Además, hay cambios en los reflejos y una elevada cuenta celular en el líquido espinal. Se estima que un 65 por ciento de casos reconocibles durante las epidemias de poliomielitis eran no-paralíticos. Es posible que pueda haber una cierta implicación desconocida en el músculo. La poliomielitis paralítica muestra los mismos síntomas que la no-paralítica más la debilidad en uno o más grupos de músculos. Se clasifica comúnmente de la siguiente manera: ESPINAL: Este tipo es el más frecuente y se asocia con la implicación del tronco o de las extremidades; más a menudo, en las extremidades más bajas. La debilidad no sigue ningún patrón. BULBAR: Los síntomas pueden incluir dificultad en tragar, pérdida de calidad en la voz, a veces parálisis de la lengüa y parálisis facial. BULBOESPINAL: Este tipo de implicación es generalmente severa y se asocia a la debilitación respiratoria. Diez a veinticinco por ciento de los casos de parálisis considerados durante las epidemias de poliomielitis eran del tipo bulbar o del bulboespinal. El virus de la poliomielitis afecta el cuerpo atacando el sistema nervioso central; específicamente las células del cuerno anterior. Estas neuronas motoras están situadas en la parte delantera de la médula espinal y son esenciales para cualquier actividad del músculo. El diagrama simplificado muestra una sección transversal de la médula espinal. Las neuronas motoras arraigadas en el cuerno anterior van hacia afuera a través de los nervios periféricos para enervar la fibra del músculo. Dependiendo de la localización de los músculos a los que proveen, estas neuronas motoras pueden ser de algunas pulgadas o varios pies de largo. Los nervios sensoriales van desde sus receptores especiales a la médula espinal y entran en el cuerno posterior. Los nervios sensoriales son raramente afectados por el virus de la poliomielitis. Muchos individuos perdieron la función considerablemente durante la etapa aguda de la poliomielitis pero recuperaron gran parte de esa función. Sin embargo, aparece, que un porcentaje de estos individuos están experimentando renovada debilidad, acompañada a veces por fatiga o dolor. Los estudios definitivos son incompletos, pero la mejor evidencia médica en este momento indicaría que, la combinación de factores asociados con el sobreuso es la responsable. Si vemos detalladamente el proceso de recuperación podemos ver porqué éste es así. El virus de la poliomielitis ataca de diferentes formas. A veces el daño a la neurona motora no es severo y las células pueden recuperar mucha de su función. Otras neuronas pueden sufrir un daño más completo e irreversible. Sin embargo, si éste es el caso, a menudo la función puede ser restablecida através del brote de los retoños”. Las células de la neurona motora tienen la capacidad de enviar los nuevos axons que pueden enervar las fibras vecinas del músculo, cuyas propias neuronas se han destruido. Las neuronas motoras,normalmente enervan entre 200 y 500 fibras individuales del músculo. Si un porcentaje de las neuronas motoras se destruye, y ocurre el brote, las neuronas motoras restantes pueden enervar tanto como cuatro veces la cantidad normal de fibra del músculo. Se asume que la carga adicional que ésta pone en el metabolismo de la neurona motora, a través de los años, produce un fracaso en la fuerza del impulso. Esto parece comenzar cerca de 20 a 30 años después del inicio de la poliomielitis, y es probablemente un factor que contribuye para la renovación de la debilidad. Otra causa posible para esta debilidad renovada, especialmente en individuos más ancianos, es la pérdida normal de neuronas motoras. Ésta es una parte natural de envejecimiento. Se estima que una persona comenzará a perder cerca de un uno por ciento de sus neuronas motoras por año después de los 60 años de edad. Esto no es muy significativo si un individuo comienza con el 100% de sus neuronas motoras, y todo está intacto y sin daños. Desafortunadamente, éste no es el caso de muchos viejos sobrevivientes de la poliomielitis. Su fuente fue agotada por el virus de la poliomielitis, y esta pérdida gradual tendrá un impacto mucho mayor. Algunos individuos pudieron haber ganado un grado de recuperación acumulando la fuerza de su musculatura restante a través del ejercicio y uso intenso similar al entrenamiento atlético; un término llamado hipertrofia. Sin embargo, estos individuos, usaron esta fuerza en sus actividades cotidianas y los músculos se han estado usando continuamente en un nivel que no es tolerado más tiempo. La debilidad del músculo, debida a la poliomielitis es a menudo asimétrica. Esto puede agregar tensión en todo el sistema neuromuscular, así como agregar tensión a las coyunturas y ligamentos de soporte. El resultado puede ser un aumento de dolor como el de la artritis. La pregunta que ahora se presenta es, qué se puede hacer para aliviar esta condición o para prevenir más degradación de la fuerza muscular? Primero, un individuo debe buscar consejo médico para eliminar otras posibles causas de sus síntomas. No porque una persona haya tenido poliomielitis, la hace inmune de otras dolencias físicas. En segundo lugar, se recomienda altamente que se haga una evaluación física completa. Esto debe incluir el examen de un especialista ortopédico, y completar pruebas de la función pulmonar. Idealmente, éstos deben hacerse por médicos que están familiarizados con poliomielitis. Usted debe pedir estos resultados por escrito. Incluso si no existe ningún problema inmediato, ésto le proporcionará una base para medir su futuro estatus. Un especialista ortopédico puede recomendar abrazaderas, u otros artefactos de asistencia, para ayudar a aliviar la tensión que toma lugar sobre músculos y coyunturas debilitados. En algunos casos esto es suficiente para detener la progresión de la debilidad. La cirugía selectiva puede a veces redistribuir el control residual y así se reduce el esfuerzo. 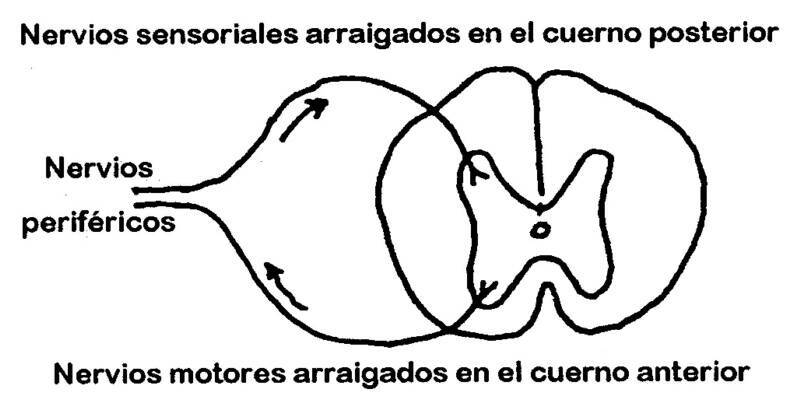 El uso de artefactos de asistencia (silla de ruedas eléctrica, motosilla, etc.) es resistido por algunos individuos. Ellos sienten que se están rindiendo a sus nuevos síntomas. Lo que ellos asumen que es una carga puede realmente liberarlos. El uso de estas ayudas les permitirán conservar su energía para esas actividades que ellos sientan son más importantes. Porque la función pulmonar tiene tal importancia en la salud general del individuo, esta área merece un énfasis especial. Las tablas establecidas para capacidades vitales listan las variables para la edad y la altura. Estas no pueden tener mucha aplicación para muchos de nosotros. El volúmen verdadero, medido en litros o mililitros, es el mejor indicador del estado pulmonar. Esta prueba, generalmente hecha con un espirómetro, es sencilla y no invasiva. Es una buena idea tener su capacidad esencial medida acostado, así como también sentado. Para cualquiera con un volúmen de menos de dos litros debe hacerse un seguimiento por lo menos una vez al año. Las medidas arteriales de gas en la sangre por oxígeno (CO2) pueden ser garantizadas. Generalmente, los niveles de CO2 entre 35 y 45 son considerados normales. El nivel CO2 en la sangre puede llegar a elevarse, gradualmente, sin que usted se de por enterado del cambio. Si el nivel llega a ser lo suficientemente alto, la habilidad de la sangre de llevar oxígeno se dañará. Esto podría tener como resultado dolores de cabeza o interrupciones en el sueño y puede ser un indicador de insuficiencia respiratoria. La función respiratoria puede ser afectada también por escoliosis (desviación lateral pronunciada de la columna vertebral) o una reducción en la flexibilidad de la jaula de las costillas que a menudo ocurre cuando una persona envejece. Muchos individuos han preguntado por el papel del ejercicio en aquellos que experimentan los efectos tardíos de la polio. Desafortunadamente, no tenemos respuesta a esta pregunta. Han habido estudios que indican un diez por ciento de aumento en la fuerza del músculo siguiendo programas controlados de ejercicio. Pero el número de participantes era demasiado pequeño como para llegar a alguna conclusión definida. Si una persona siente que un ejercicio adicional puede beneficiarlo entonces es probablemente mejor un ejercicio de tipo aeróbico. Se podría tratar un programa de veinte minutos compuesto por dos a tres minutos de actividad seguida por un minuto de descanso. Si esto lo hace sentirse mejor continúe, pero, si los resultados son dolor o fatiga, reduzca el ejercicio hasta un nivel que pueda ser tolerable. Parar completamente puede ser mejor. Un porcentaje significativo de sobrevivientes de polio realizan todo el ejercicio que ellos pueden tolerar en sus actividades de la vida diaria. Y, si es verdad que ese sobreuso es una causa que contribuye a la debilidad renovada del músculo entonces un arduo régimen de ejercicio debe considerarse con cuidado. El Departamento de Salud de los Estados Unidos estima que hay cerca de 1.6 millones de seres sobrevivientes de polio. Esto haría a la polio la segunda causa más grande de incapacidad en los Estados Unidos. Sólo los sobrevivientes de embolia constituyen un grupo más grande. Aunque un porcentaje significativo de estos sobrevivientes de polio experimente algunos efectos tardíos no hay razón para esperar que todos sean afectados de la misma forma. Si usted apreciaría más información sobre este tema y temas relacionados recomendamos que usted lea varias publicaciones de la Post-Polio Health International. Las preguntas relacionadas con estas publicaciones deben ser dirigidas a G.I.N.I. en 4207 Lindell Blvd., #110, St. Louis, MO 63108 USA. El teléfono (314) 534-0475.